← The ruined fortresses in the desert. Oliver, Katya and Austin had all left Khiva and I was confronted with the question, how to get out of here? Back in London I had paid for a visa for Tajikistan for the month of August and here it was, the 22nd. If I wanted to use that visa I had better get moving. But how was I to travel from here in Khiva to Dushanbe? My friendly travel agent had given me an estimate for travel to Dushanbe via Tashkent, Almaty in Kazakhstan and then Dushanbe. There is no direct flight, no straight through bus service, Uzbekistan vehicles are not allowed through the border control and I couldn’t rent a helicopter (I looked!). The proffered quote was for over $500.00 and would not only would take thirty six hours but did not include taxis or overnight hotel charges, I was therefore looking at about $600.00+ to go approximately 280 miles as the crow flies. This seemed ludicrous. There was an alternative, fly down from Khiva to Tashkent, have a driver meet me at the airport, drive me to the border, walk into Tajikistan, find a driver to take me to the nearest airport (Khujand) and try and get a flight from there to Dushanbe. Failing that I could find a shared taxi to take me the one hundred and ninety miles from Khujand to Dushanbe. This latter route is mentioned in all the guide books as the most economical and practical method of travelling between the two cities. The flight from Khiva was unexpectedly short, the lady next to me prayed the entire way, it was an Airbus instead of the usual Ilyushin prop plane and my driver was waiting to take me to the border. There were storks with huge nests built on top of the electrical pylons on the way. In an ok Chevy we sped the 150 kms and suddenly, without warning it was time to get out and walk. Bag on back I sallied forth. Just to leave Uzbekistan I had to pass through four checkpoints, fill in two more forms (questions in Russian only) ,had passport inspected by four different commissars. Then finally out, into no mans land. A half mile walk up a hill then the first Tajik border guard who wanted my headphones before he would give me an entry form, no, I wasn’t wearing them, they are built into my jacket. I declined. Filled in form in duplicate, went through customs, bags x-rayed, passport inspected, questions asked which I didn’t understand, “Britannia” seemed to be the right answer to most of them. 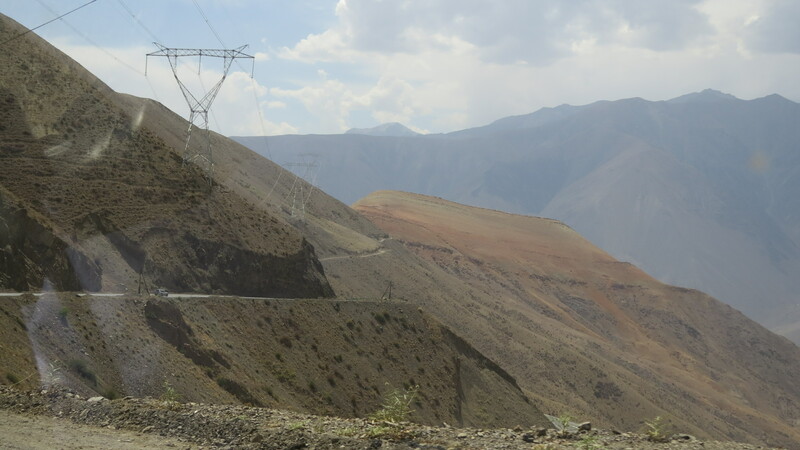 Another long walk shadowed by some nasty looking Alsatians, through the last check point, and I was into Tajikistan. I felt like I was in a scene from a John le Care book. It was nearly dark by this time, which was not the plan at all so instead of trying to find a taxi to take me all the way to Dushanbe I opted for the airport 60 kms away. Negotiated down from $60 to $30 and away we went in a Mercedes. After about an hour I was dropped off at the airport in Khujand and there was nobody there. A few night workers, the 24 hour coffee shop staff, and Police. Ok, this is bad I said to self, many times, as I walked around trying to make sense of what to do. There was a flea bag hotel which was charging $5.00 for some sort of room with no wifi. There were sundry derelicts sleeping on benches. I was stopped by the Police who made it clear that I should not be there. Nobody spoke any English whatsoever. To cut it short and many, many “ok, this is bad”s I eventually spoke to some random kid’s girlfriend on his phone. She spoke a little English and I explained I wanted a taxi to go to the hotel on the big billboard nearby. Two very scary hours behind me and there I was sitting in the back yard of the hotel with a very welcome beer and bottle of water plus incongruously, two BMWs. They had wifi so I could Skype back home, which was a comfort, and my nerves settled down. The first incline, a foothill? Yes, speed drops from 100 to 60kmph, no more melon stands, no more green, overtake very slow buses. Up and over now down again across another plain, looks somewhat like a mesa, with the mountains looming in the distance. There are clouds, anxiety starts for bag, on roof, with computer and misc electronics, and will it rain? Other cars back at the departure lot were putting plastic over their roof racks. 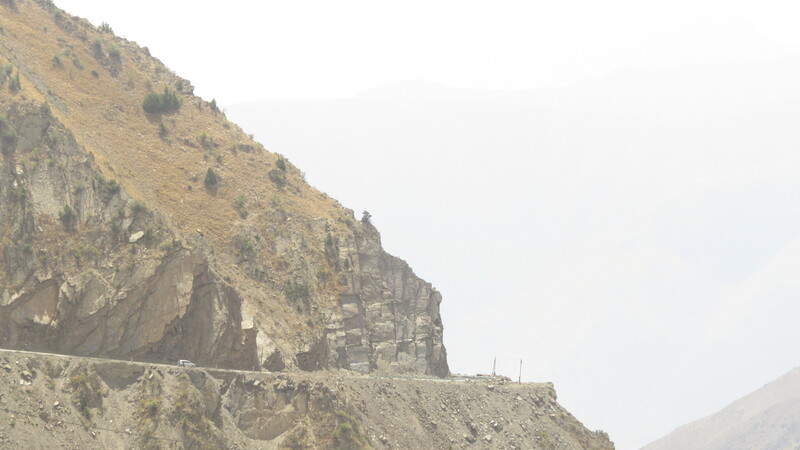 Start climb up deep river gorge, villages with mud houses, many donkeys, honey stalls, beehives, and melon trucks grinding up the hill doing less than 5kmph, hazardous. The cops at the checkpoints are wearing mountain clothes; I thought it was getting cooler. Up and up, climbing, climbing. Ladies harvesting the grass for fodder with sickles. A stream tumbling beside the road, people are picnicking. Dushanbe 168 kms, we are about half way. A tunnel ahead……..we have now been in it for five minutes, this is some long tunnel. Out the other end after six minutes, my feeble math makes that about four kms, quite a long tunnel. Ok, now it’s getting scary, white knuckle driving, the road is carved out of the mountainside, rather a long drop to my right, I feel a bit sick. I wish our driver would stop answering the phone. Oh really, I can’t look! Actually it’s rather beautiful, but I still feel sick! The good part is that we are descending so the drop is decreasing, I hope. We are down. No more scary hairpin bends for the moment. SNOW on the distant summits. We stopped three hours into the trip at a restaurant. Everyone filled their water bottles from a spigot, which I am sure was crystal clear spring water, but it did look a funny color. So I didn’t participate and searched around for 7Up or something with a seal on. No such luck until the driver beckoned me over and we indulged in tea. Nice of him to share with the dumb Westerner. Back on the road again and immediately there was a rock fall right over us, loud cries of Allahu Akbar as rocks hit the side of the 4by4. They missed the windows fortunately and on we go. Now it’s raining, I did check on my bag during the stop and there is another strapped above it, maybe it will be ok. I am trying to work out why, as we descend, there is a raging river on our left flowing the other way. The road descends and the river is definitely going the wrong way. My brain must be befuddled/addled? Climbing again overtaking trucks grinding their way up, some with huge trailers. Those little villages we passed through before the climb that we can see far below must be cut off during the winter, I wonder for how long. Uh oh, getting scary again. Higher and higher, closer too the snow line. Another tunnel, this one filled with dust, on coming traffic looks ghostly in the headlights.. Sister Sally certainly wouldn’t like this one! Oh great, there is a truck, stuck. Now down to one lane. This isn’t very nice in the pitch dark. There is road building equipment and people fixing the atrocious road surface. It’s rather like being in a movie, bouncing around in the gloom, ghostly lights all around, splashing along through a flood. We have now been down here for fifteen minutes with no end in sight. The smaller cars are having a rough time of it, swerving all over to avoid the deeper potholes. Still clouds of dust and its hotter and darker. We’re out after eighteen minutes. No more tunnels today please. 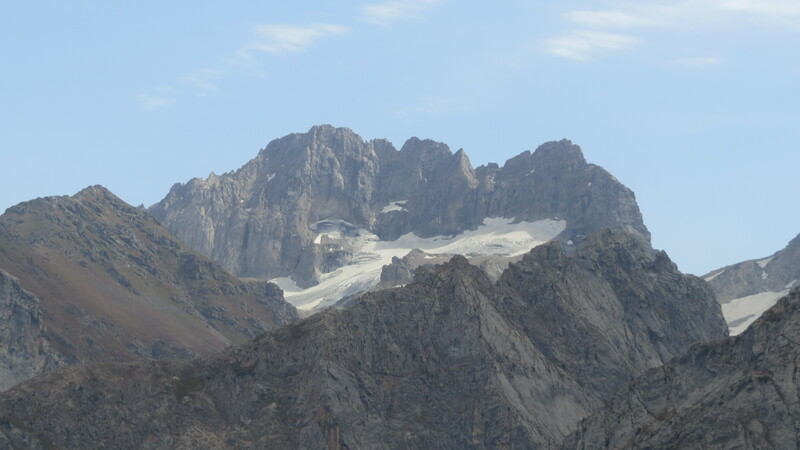 Oh look, there are glaciers up here, lots of them, what a thrill. We are above the snow line with a river far, far below and it’s only just a little bit scary as we descend. Lots of avalanche shelters over the road, short tunnels, or are they for rock slides? They are mining coal somewhere close. Massive coal trucks ahead of us at the roadblock. Just had a “Mister, what are you writing?” from over my shoulder, I told him and he told everyone else, so now there is much pointing going on, showing me things of interest, especially the ridiculously bad drivers. We all laugh. 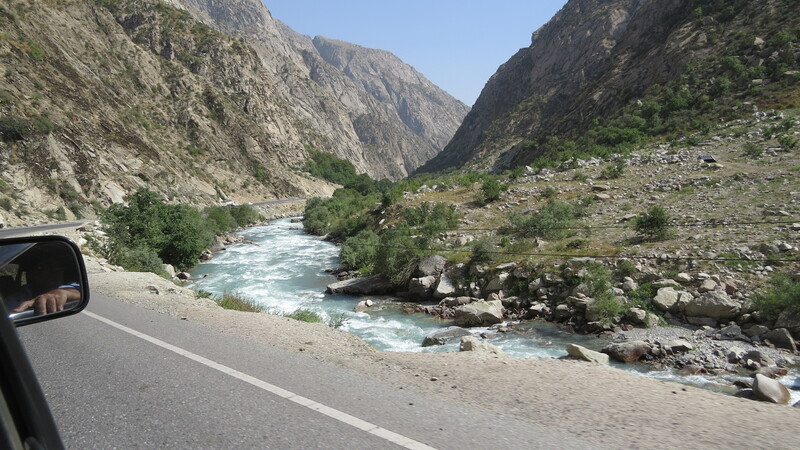 As we roll down the mountain towards Dushanbe we have picked up another river beside us, flowing correctly, and the further we go the wider it gets, noisy too even over the traffic noise. My over the shoulder neighbor tells me it’s the Yarzob. And now we hit the five hour mark though there are signs that Dushanbe is getting closer, there are hill chalets (dachas), interesting looking restaurants overlooking the river, hotels with swimming pools, banks, supermarkets, it’s getting green again, lush even, and it’s hot after our adventures in the snow. I have crossed the Warzob mountains and made it to Dushanbe. NB. This is the expurgated version of an email I sent to family and some friends immediately after arriving at my hotel. Opinions differed! Some said intrepid or epic, others foolhardy. I received all sorts of advice. My Mother hastened to a glass of sherry! (sorry Mother). Some people apparently couldn’t read all the way to the end. Interestingly, I woke up on Sunday to find my social media feed full of news of a 6.0 earthquake back home, so ya know………. 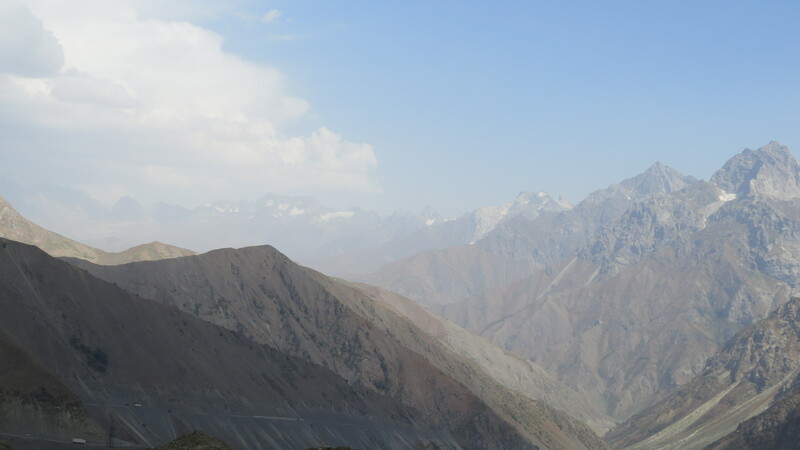 This entry was posted in Uncategorized and tagged Dushanbe, Khiva, Khujand, Tajikistan border, Tashkent, Tashkent to Dushanbe, Uzbekistan border, Warzob Mountains, Yarzob river. Bookmark the permalink. Wow Tim this is really something! What a scary adventure! It had its moments Laurie, it had its moments. I was happy to arrive. Am really in a muddle now.Thought you were actually in Dushanbe now. Shall be relieved when you get to China!! Sorry for the confusion, but yes I am in Dushanbe and enjoying being here. What about that river flowing in the wrong direction…did you make sense of that? Great story….so glad you made it! No. I still haven’t, it worries me! Maybe the Google will shed some light on the subject. Stunning photos Tim; scary but incredibly beautiful. time now for a few days of peace and mundanity – your Mum will be pleased, as will many of your friends here! I am now nearing the end of day three of mundanity here in Dushanbe and am loving every moment. Reading, writing and keeping in touch with family and friends far away. The biggest challenge is where to have dinner.